Welcome to the Texas Transit Association! The Texas Transit Association (TTA) was organized in 1986. Our members are Texas metropolitan, small urban and rural transit agencies as well as private and public entities from across the United States. 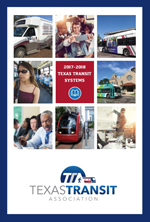 TTA’s purpose is to educate the people of Texas about issues affecting the public transit industry within the state. Additionally, TTA actively supports public transportation in the State of Texas and works with members of the state legislature in the pursuit of additional resources to support public transportation. East Texas Council of Governments (ETCOG)/GoBus has an opening for an Associate Director of Transportation. Waco Transit has an immediate opening for a part-time (with the potential for full time) position in outside sales and an opening for a career minded individual for the position of Safety and Training Coordinator/Transit Supervisor.